Today's outfit was inspired by Harry Belafonte's "Jump in the Line." I'm not kidding! One evening I got home from work and was blasting this song on repeat, dancing around our apartment and needed an outfit to wine up in for dramatic effects. I've actually had this skirt since 2005 and you're probably wondering how I remember the year, right? Well, it was the year I visited my Dad in London and we went shopping together. This was one of the first pieces we picked out (Dad has good taste too) and it actually became my church skirt. 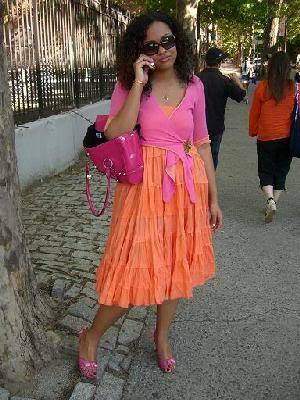 I wore it to church in London then again as a dress in New York. So yes I dressed up and danced in my mirror in this outfit then decided I'd take it to Aruba with me. This time I did a little trick Mom taught me and tucked a piece of the skirt hem into my waist. It gives the illusion of more ruffles as well as a thigh-high split. Below are very blurry images of when I wore this skirt as a dress (to church) almost 12 years ago! My bestie snapped this #streetstyle pic of me and at the time we called it the #paparazzipickcha. Who knew people would start sharing paparazzi pickchas (Guyanese pronunciation for picture) for a living (aka style bloggers)?! Anyhow, enjoy the images and the rest of the lyrics to this song and be sure to check my IG page for a fun video set to the music. Sing and dance along! Oh, and definitely get the look!